Venice Gourmet Delicatessen is a family owned and operated Mediterranean-style marketplace established in 1969. 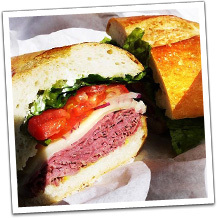 We pride ourselves on our full-service delicatessen where we prepare sandwiches and salads to order. See our Deli Menu Page for a list of our most popular club sandwiches. We are also a gourmet boutique gift shop offering an extensive selection of international fine foods, premium wines, copper, kitchenware and wine accessories. We hope you enjoy visiting our online store. 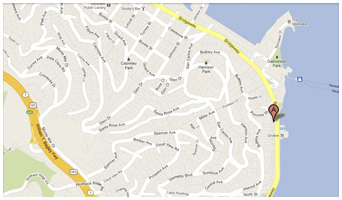 We look forward to seeing you soon on your next visit to Sausalito and the San Francisco Bay Area. Molinari Italian dry salame, mortadella, provolone cheese with olive oil, vinegar, lettuce, tomato, and red onion. Turkey breast, Black Forest ham, fresh avocado with mayonnaise, lettuce, tomato, and red onion. Top round roast beef, cheddar cheese with mayonnaise, lettuce, tomato, and red onion. Freshly sliced avocado, creamy Brie cheese, alfalfa sprouts, green apple, cucumber, tomato, lettuce, red onion, and a little mayonnaise. Seasoned turkey breast with mild salsa, with mayonnaise, tomatoes lettuce, and red onion. Grilled eggplant, fresh mozzarella cheese, with pesto sauce, lettuce, tomato, red onion, and olive spread. Roasted red peppers (in house), feta cheese, lettuce, tomato, red onion, with olive oil, and vinegar. Corned beef, Swiss cheese, sauerkraut with special Russian-style dressing. Chicken breast topped with barbecue sauce, lettuce, and fresh tomato. Freshly sliced avocado, your choice of cheese, alfalfa sprouts, mayonnaise, mustard, lettuce, tomato, and red onion. Garbanzo bean spread, cucumber, lettuce, tomato, and onion. Fresh mozzarella cheese, tomato, seasoned with extra virgin olive oil and fresh basil. Proscuitto di Parma (Italy), Serrano Ham (Spain), Beef Tongue or Cappicola (Molinari, San Francisco). Our selection varies on what is made fresh everyday. A combination of our freshly made salads on a bed of greens topped with grilled chicken. A combination of our daily fresh salads on a bed of greens topped with delicious prawns. A combination of our daily fresh salads on a bed of greens topped with an excellent smoked salmon. Field greens, Prosiutto di Parma, tomatoes and fresh mozzarella cheese. Our sandwiches are made fresh to order on your choice of bread roll: Sourdough, French, Dutch Crunch, or Wheat rolls. We also offer gluten-free bread as well as sliced whole wheat, white or rye bread. Condiments options are mayonnaise, mustard, lettuce, tomato, pickle, red onion, pepperoncini or jalapeno.